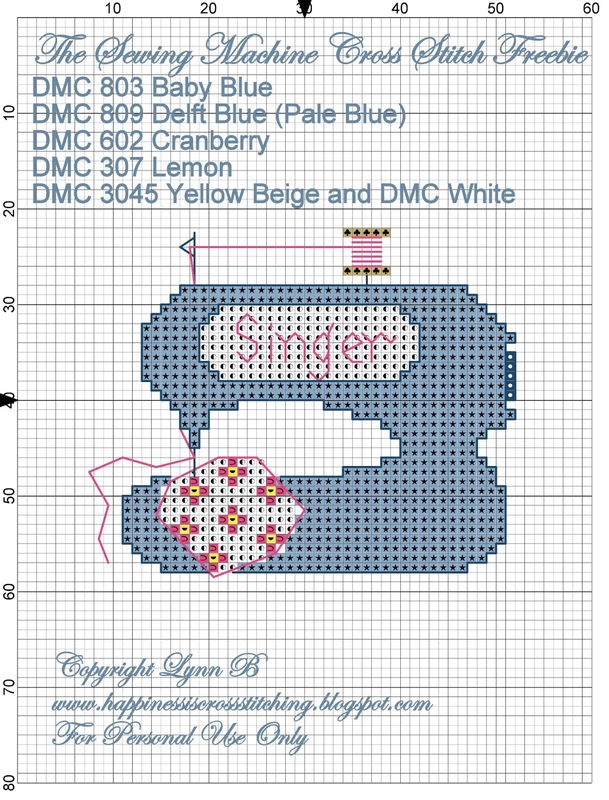 Happiness is Cross Stitching : Freebie Friday! Edited: Not everyone has a google docs account for you to access the pattern, I have therefore put them in the post below, just click on the pictures and then click 'save as' to your computer. If anyone has any problems please email me. Hi everyone, from now on I thought I would post my free cross stitch patterns on a Friday, here is my first Friday Freebie, I hope you like it! 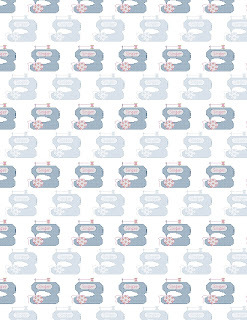 I have also designed matching paper and gift tags for this design too. 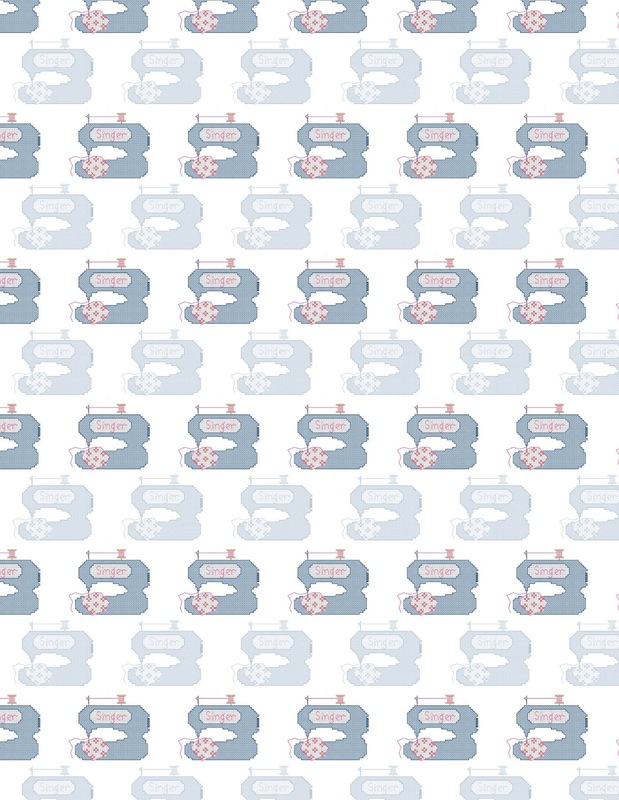 If you have a Google Document account you can access the free cross stitch chart for The Sewing Machine, the gift paper and the gift tags here and you can now also access them below. 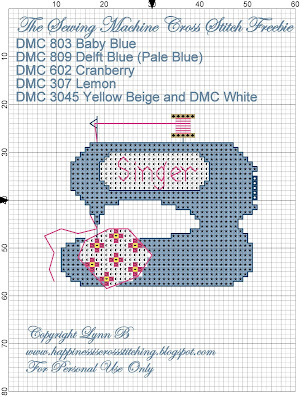 The Cross Stitch Pattern for The Sewing Machine. Click picture and then right click 'save as' to your computer. Click on the picture and then click 'save as' to your computer. Until next time, happy stitching. I love the free pattern you are offering (and thank you so much) but when I click on the links, it does not take me to the pattern. Help please? You are just so clever Lynn. Will look out on Fridays. Thank you for sharing your creativity with us. Always love to read your blog, do not always comment. Especially love the color of your new room. I also painted my room blue but very light - periwinkle. Thank you what talent you have I love every thing you make hugs. Thank you what talent you have, I love every thing you make. Here is your follower 2606. I'm swept away by this huge number. I can only dream of it. I just began to blog and I 'm terribly happy every time a follower joins my blog. It' amazing, so many people from all over the world. I really like your stitching, so small, so cute. Oh, and I absolutely adore your blue room. Que bonitos los motivos que tienes y ls bordados son preciosos, te dejo mi blog por si te quieres pasar. Thank you so much Lynn for the lovely freebies and blog! I love this. Perfect for some gifts for my quilting group. Thanks. Beautiful, thank you for sharing! Perhaps I can use it in my printer drawer. Delightful and thank you for sharing!